Thanks to a legacy of almost £90,000 from Elisa Watson (recorded in church), the church of 1935-38 towers over the houses of western Eastbourne. 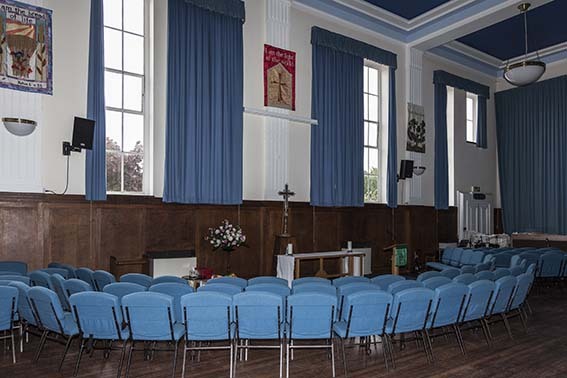 Even when built, its size appeared unnecessary and in an age when a capacious and well designed church could be built for under £15,000, the diocese would have preferred to have built several churches with the money, but were prevented from doing so by the terms of the will. The unusual spelling of the patron saint’s name is said to have been determined by the spelling of Elisa Watson’s name (information from Nick Wiseman). The church stands between a conventionally neo-Georgian vicarage and a hall, all built on a site given by the Duke of Devonshire (Arch J 91 p353). Though the church is in a simplified gothic, the use of brick throughout and its low-pitched roofs prevent any clash of style. As at St Bartholomew, Brighton, a tower would have had to be massive to be in scale and there is simply a belfry on the southern of the inconspicuous, lower transept-like structures. The architects were P D Stonham, and his partner A R G Fenning. Fenning, who died before completion, may also have been responsible for the hall and vicarage, which were built first (ESRO Par 316/4/5). The firm of S J Tatchell and G C Wilson were employed as consultant architects (ibid Par 316/4/2), but the detailed specification of work dated 1934 in the parish records is entirely by Stonham, who is described in a contemporary record dating from before completion as the sole architect (CDG 18 p341) . The tall interior has grey walls beneath a curving, panelled ceiling; colour is limited to the painted bosses on it. Though the chancel is slightly narrower, the church is a single space, with low arcades and aisles and no east window. There are galleries in the transepts and a west one for the organ. The slightly raked floor and the curious light fittings, suspended on brackets projecting above the arcades, recall contemporary work in cinemas and the like. Most fittings are plain, apart from a stone lectern and pulpit. A small, dark north chapel is screened from the main church. 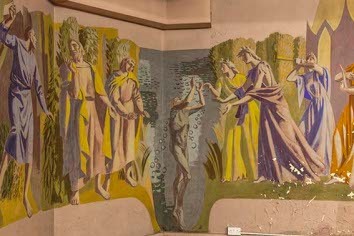 The site slopes, so there is an undercroft, which became a Chapel of Remembrance and was decorated with murals (see below). W A Forsyth repaired the church in 1949-50 (recorded in church) after bomb damage in 1944 that contributed to its longer term undoing. In particular, during construction ungalvanised iron ties had been used, which were corroded by damp penetration after the bombing. Over a period of time after the re-opening this made the whole structure unstable until in 2003 it was decided that in view of the cost of repairs, the church should be made redundant, with a view to demolition, though the congregation was substantial and has continued to worship in the hall, which has been adapted for worship. Few fittings were transferred except some engraved glass doors that are now at the inner entrance to the hall. At this time, it was intended to retain the undercroft of the church (ESRO Par 316). Though subsequently listed, the church was ignored by Pevsner, reflecting a lack of interest in architecture of its period, and the requirement of the planning authority for efforts to find an alternative use produced no result. In 2005 it was on offer to anyone who would do the repairs, estimated at £3 million (SPAB: Buildings of Historical Interest in Need of Repair and for Sale, no 145 (Spring 2005) etc), but no viable scheme emerged and the church still stands empty, boarded up and damp-streaked, a sorry sight. 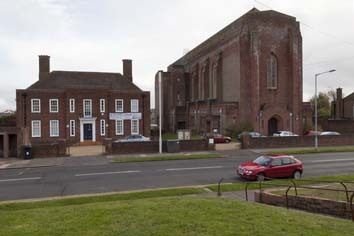 There were more recently plans for conversion into flats with, as with the proposal of 2003, the retention unchanged of the Chapel of Remembrance only, but the continued decay of the structure has made such plans unrealistic and a decision was taken in principle to demolish the church, including the undercroft. 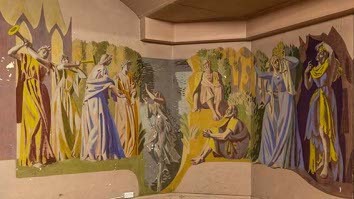 However, the Twentieth Century Society, in the hope of interesting the Tate Gallery in the preservation of the murals by Feibusch (see below) secured a reprieve in 2014 (Chichester Diocese: Reports to Diocesan Synod, 2014). This seems to have had little success and, most recently, in 2017 the Church Commissioners were reported (Eastbourne Herald 24 November 2017) to be preparing a scheme for demolition and sale of the land. Carving: (Mullions of north chapel window) Crucifixion by E W Tristram. Font: Plain Clipsham stone, designed by the architects at a cost of £100 (ESRO Par 316/4/2), in keeping with the other stone fittings, which are probably also by them. Glass: (East window of north chapel – vandalised) Goddard and Gibbs, 1950, designed by A E Buss (DSGW 1958), replacing one by E W Tristram (ESRO ibid) that was destroyed in the bombing. 1. (Band of murals around east end above curtains) E W Tristram, 1938 (www.BritishListedBuildings.co.uk) in a wooden style derived from Italian gothic art. 2. 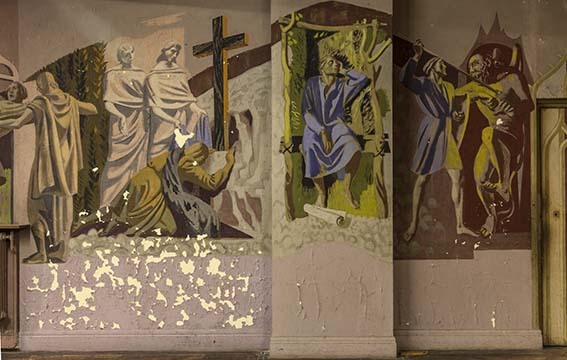 (Chapel of Remembrance in the undercroft) H Feibusch painted the murals based on The Pilgrim’s Progress without charge in 1944 (Brown). Bishop George Bell took a particular interest in the context of his scheme to encourage contemporary art in churches. Their condition is deteriorating (see the photographs in 1), though last minute efforts to rescue them still continue (2018). To a greater extent than with most of Feibusch’s work, there is an element of sentimentality that relates more to contemporary English art than his own earlier involvement in German Expressionism. This apples in particular to some of the colours used, especially the yellows and violets of certain scenes. Reredos: This consists of draperies beneath a high tester. 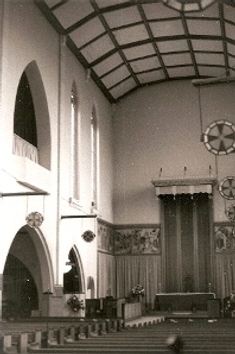 The photograph of the interior dates from 1976. 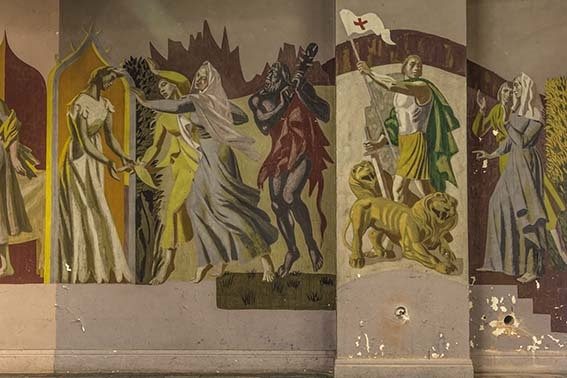 My thanks to Nick Wiseman for the photographs of the exterior, the hall and of the Feibusch murals, together with continued updates on the current state of the church.